Our region comprises the area around Pittsburgh, Pennsylvania. We are dedicated to providing a safe and fun venue for Motorsports in Western Pennsylvania. Steel Cities takes great pride being able to offer motorsports activity’s since the 1950’s. Steel Cities has the longest running continuously named event in the country, 2018 will be the 66th Cumberland Road Race. In addition, we are proud in being able to offer activities also in, TimeTrails, Auto Cross, Hill Climbs and Road Rally Programs. 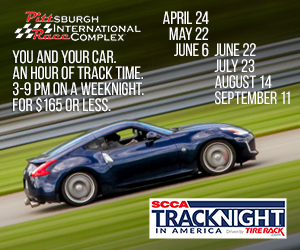 As a Steel Cities Region SCCA member, we invite you and your family to come out and play with us, as a driver or as a volunteer. Our home track Pittsburgh International Race Complex has been newly renovated and is awaiting your arrival. You will find a mixed group of people that all have one thing in common – HAVING FUN WITH CARS! There are about 500+ members in STC. We’d love to have you join the fun! By accepting membership in the SCCA all members agree to abide by all SCCA rules and regulations and conduct themselves according to the highest standards of behavior and sportsmanship in a manner that shall not be prejudicial to the reputation of the Club or fellow members.